Quark Soup by David Appell: What Does Real Data Say About Climate Sensitivity? What Does Real Data Say About Climate Sensitivity? A recent comment got me thinking: what do the data actually show for climate sensitivity? Climate sensitivity (S) is the change in global mean surface temperature for a doubling of atmospheric CO2 level. 1) "temperature" and "CO2 level" are the 10-year moving averages. which agree better than I expected. The first is calculated over the 44-year time period of Feb 1968 to today, because the CO2 dataset starts in March 1958. The second is over the 23-year time period November 1988 to today, because the UAH dataset starts in December 1978. If you instead use the 5-year moving averages, I find the current climate sensitivites are 1.5°C and 1.4°C, respectively, but they fluctuate by several tenths of a degree depending on what end period you pick. Other choices of temperatures, CO2 levels, and datasets are left as an exercise to the reader. Of course, there are all kinds of IABs here (if, ands, and buts). I've ignored all other factors that influence climate, particularly aerosols. They're in the data, and may be keeping the planet cooler than it would otherwise be, but keeping the air polluted (and having to add more) hardly seems like a solution to the global warming problem (unless it involves, say, geoengineering by nonharmful aerosols put there on purpose, such as marine cloud brightening). And, of course, feedbacks may just be starting to kick in, like ocean saturation, the ice-albedo effect, Arctic methane emissions, etc. And temperature change may be more than (and more complicated than) log(C) for higher values of C. See, for example, Appendix B of the famous 1988 Hansen paper. The IPCC finds S = 2.0 - 4.5°C, and the recent Schmittner paper in Science finds S = 2.3°C with a range of several tenths of a degree. Is a climate sensitivity of 2.0°C worrisome? That, too, is left as an exercise for the reader. Right now CO2 levels are increasing at about 0.5% per year, up from about 0.4%/yr in 1975. That would imply CO2 levels will be about double the pre-industrial level of 280 ppm by about the year 2070. US readers: remember, a change of 2.0°C is 3.6°F. The most commonly used definition of climate sensitivity is the equilibrium sensitivity, or Charney sensitivity. The value used most often is the equilibrium temperature increase after doubling CO2 concentrations. You can't read this directly off modern measurements, because the Earth is not at an equilibrium as yet... it takes some time for this to occur after you get to a new CO2 level, because it takes time for the ocean to warm up enough to bring the Earth back to a radiative balance. What you are calculating is rather closer to "transient climate response", which is the temperature increase after 70 years of 1% per year CO2 increase, which is a doubling of CO2 -- but without waiting for the temperature to come to equilibrium with the new concentration. The value for this is less than the equilibrium response you are quoting. You are also ignoring everything other than CO2, as you have noted. The point is, this renders the calculation almost meaningless. Climate sensitivity is not something you can read that easily from recent data. That's why is remains with large uncertainties. It's constrained mainly by data relating to periods before modern measurements but for which forcings can be estimated (like changes since the last glacial maximum, for example) or by some quite tricky calculations (not nearly as simply as you represent) of major events like the big eruption of Pinatubo in the 1980s (I think, from memory? ), or else as a diagnostic value of climate models. Simple calculations won't do it for you. This would be something you would be well advised to take up further as a question for the climate response group set up to help journalists and law makers with such questions of climate science. You are also leaving out any natural drivers. Something caused the rise in the first half of the last century so it's possible most of the rise in the second half is also natural variation. So 2oc is actually a maximum. 1oc is certainly plausible. Is 1oc a crisis or actually beneficial. More co2 fertilization, longer growing season in Canada et al. Modest rise in sea levels. We just do not know. Thus the only thing I support is R&D on non-carbon energy (paid for by new oil and gas leasing for near term job creation). Charles: the natural drivers are in the temperature data. sylas: Thanks -- very good point about the equilibrium climate sensitivity. Yes, the natural drivers are in the temperature data but your analysis attributes all of the rise to co2 rise. 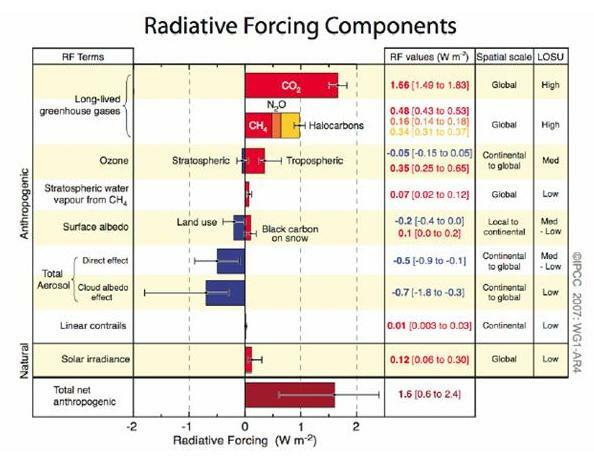 Let us remember that the current attributions of radiative forcings have CO2 ~3x that of the next set of forcings. Charles; your comment suggests "most of the rise" might be "natural variation". That's nonsense; there's no reason whatever for thinking that. ESPECIALLY not looking at rises 50 years prior. The rises at present are anthropogenic. That's about as certain as you can make it. But it's not all CO2. The natural forcings matter; but in the reverse of the way you suggest. Available evidence indicates that they are mostly a cooling contribution. You are giving speculations that are amply refuted by data. David's article didn't consider enough data to support the quantified analysis. There's a major difference in degree between those two positions. You are wildly off on a different bizarro world of some kind. David is trying to figure out this one -- as am I. You should come join us. He is merely re-working the current ...lie... talking point about how CO2 is rising, but it hasn't warmed so CO2 can't be the culprit so those silly carbon taxes are just oh-so-bad for our economy!!!!! So natural variation accounts for the 1900 to 1940 rise, the 1940 to 1970 flatness, the 2000 to 2012 flatness but not the 1970 to 2000 rise (which is very similar to the 1900 to 1940 rise). Seems to me if we knew what caused the 1900 to 1970 rise then fall/flat we might have a clue as to the 1970 to 2012 rise then flat. I don't think anyone really knows what is going on. The entire period (1900 to 2012)? You aren't missing things so much as inventing things out of thin air. There's nothing in the graph to let you infer natural variation in one case and not another. This is not really a good place for a full tutorial in all of what we do and don't know. Suffice to say that known forcings deal pretty well with the large scale pattern; and on top of this there is smaller unpredictable natural variation associated with (in particular) ENSO ocean changes and volcanic effects. ENSO, volcanos, etc are not predictable; but you CAN see what they've been doing over recent years. Doing so suggests that -- as should follow from basic physics and known forcings -- the planet is still heating primarily from the enhanced greenhouse effect. The paper is Foster and Rahmstorf (2011) in Environmental Research Letters; an introductory explanation for a general audience of many of the various matters relating to this post (sensitivity, natural variation, additional aerosol effects, etc) is at Has Earth warmed as much as expected? (from skeptical science; strongly recommended). Early twentieth substantially affected by recovery from early big volcanoes plus an increase in solar intensity, along with some anthropogenic effects. A lull and fall mid century was due in part to aerosol effects -- anthropogenic again. However, in my view the drop here is still not well understood. The changes in anthropogenic aerosols have a role; but I am quietly expecting more is involved; possibly with the sea surface measurements, and possibly with an longer scale ocean circulation effect (cf Tsonis, Swanson and so on; or something similar). Enhanced greenhouse effect kicked off in a big way from 1970s in particular to drive strong warming. Early twentieth first century is way too short a period to jump to conclusions about anything particularly new or different. Lulls on the scale of 10 years or more have shown up a number of times. As I cited previously, you are most likely looking at one of the short-scale variations which have been apparent all through the record; not a trend at all. Main point to note is to avoid the false dichotomy between knowing all about how exactly it works; and having no idea at all and hence freedom to say any dumb thing off the top of your head. Models don't capture all the short term variations; they DO capture the longer picture fairly well -- including the broad changes of early mid and late twentieth century. In short. You are completely out of touch with the evidence to speculate that the recent warming is just more natural variation -- or that this warming has stopped. The main driver of the big increases from last century is an anthropogenic enhanced greenhouse effect. That's not in any credible doubt at all -- which is NOT a claim to know everything in full detail. The longer term natural trend has been mostly for a slight gradual overall cooling over the last couple of thousand years since the Holocene Thermal Maximum. That's now reversed, mainly because of a large increase in the atmospheric greenhouse effect. Please give me a link to the best model that shows the fit to historical temp trends and project the next 50 yrs. Oh, looky: accurate hindcasting of climate models was well-publicized a decade ago, and golly so easily found, too!! Here is a link to a comparison of the latest temperature data base and ar4 climate models with the claims they do not track well. Do you have a similar analysis that claims they do track well? Charles -- why ask me that? Are you planning to start taking notice of what scientists are doing? If so; your best bet is to chase it up yourself as a serious exercise in learning. This is a blog; not really a climate kindergarten for basic questions or tutorials on modeling. The blog article is about sensitivity. If your basic position is that you simply don't trust the scientists, then please don't waste my time asking questions where you won't recognize the answers. If you are being serious, then some pointers follow. Expectations for 50 years depend very much on scenarios; that is, what WE decide to do now. Getting background is going to be crucial to making sense of this. A good place to start is skeptical science, which I linked above already. Start at How reliable are climate models? Also see two FAQs at realclimate: FAQ on climate models (1) and FAQ on climate models (2). Data for a number of models and for an ensemble mean over the 21st century is here. IPCC repository on climate model output. The results are also explained in the IPCC 4AR, which basically is a big literature review of all the work being done; I cited the relevant chapter above. If you want to see just one model as an example, NASA's climate ModelE has a lot of results available at ModelE Climate Simulations. There's a a nice video of the temperature projections. You can also find a simple text file of the whole globe anomaly at the IPCC repository; the model files are giss-model-e for various scenarios. But in summary, the next 40 years, up to 2050, under the A2 scenario, is for a bit over 0.2 degrees rise per decade. This is a continuation of the rise at present with a small acceleration. Charles, missed that second question, sorry, with crossed posts. The tracking is better than Tisdale implies, but it is not perfect so indeed you do find discrepancies. A major one IMO is the point I mentioned previously, of the mid century behaviour. This is a totally different topic to the blog article here. If you simply want to see a sensible discussion of climate model evaluations, see the skeptical science page I listed previously. There's bound to be lots of noise about Tisdale's post at WUWT in various blogs; you'll be able to follow it if you like. It's a different topic to what David's blog here is about. If you want basic questions, I've given answers. We expect an ongoing heating of the planet at roughly 0.2 C/decade in coming decades. If you want to argue on the basic of Tisdale's "analysis", forget it. I'm not interested in that argument, not here at least. Plus I have to go catch an airplane. (And David... I did buy the carbon credits as I usually do. :-) Adios all. Science Teachers Should Welcome "Monkey Bills"
How Many Skating Rinks Will the Tar Sands Buy? Joe Bastardi: Idiot, Liar, or Both?